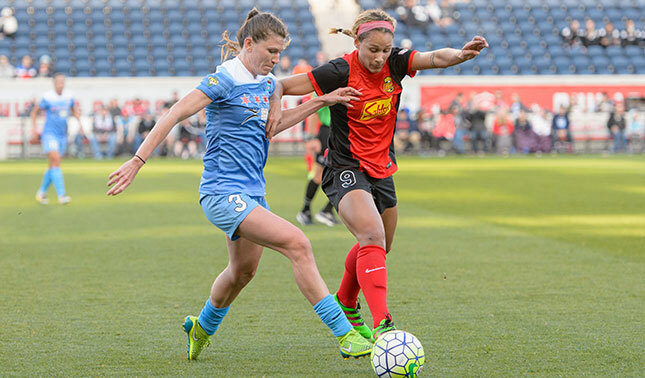 The Western New York Flash (1-1-0) dropped its second game of the 2016 season against the Chicago Red Stars (1-1-0) 1-0 at Toyota Park on Saturday night. The game started off with high offensive pressure from the visitors, with multiple corner kicks early on, but the Flash went down in the 28th minute when Red Stars defender Casey Short took a shot that took a deflection off a player in the box. The Flash managed to get off 13 shots, while putting six on goal and earning nine total corner kicks, but were unable to finish their chances. Goalkeeper Sabrina D’Angelo made some key saves to keep her team in the game including a sliding save to deny Chicago forward Christen Press one-on-one. The WNY Flash are in action again on Friday, April 29 at Sahlen’s Stadium for the first time this season when they take on the Washington Spirit. Season and individual game tickets for the 2016 WNY Flash season are currently on sale at wnyflash.com/tickets or by contacting Kayla Kent at kayla.kent@wnyflash.com.